Within Ampthill Park, on the brow of a hill, stands a memorial. Unique about this memorial is that it tells the story of the park, its use in World War 1 and contains various poetic lines. The history as listed on the memorial can be found below. The memorial has fallen into disrepair and some of the panels are missing, especially two naming the men who died in World War 1; the surnames A - FIELD are missing and HASLAM to Smith. By kind permission of the Duke of Bedford and trustees of the Bedford Estate a list of names has been supplied that records the names that were on the remaining plates and those missing. These are split on several pages alphabetically. The 11th Duke of Bedford requested the names of all the fallen from the camp documentation then placed an article in local papers to confirm that no one had been inadvertently missed; however, this may not have been the case. "If any retired officer competent to train troops has not yet applied, I hope he will communicate with me at the War office in writing." The Duke of Bedford applied and constructed in the space of two months a hutted camp in Ampthill Park for the accomodation of 1,000 men. This camp was known as the Bedfordshire Training Depot which, under the Duke's command, formed a unit of the County Regiment and supplied drafts of men to six Bedfordshire battalions of the regular army serving in France and Italy. The recuiting area comprised Bedfordshire, Hertfordshire and Huntingdonshire. Behold the price at which thoise hours were bought! The silent tribute of a grateful thought." Two thousand two hundred and thirty five officers and men joined of their own free will under voluntary enlistment. Not a man was absent from parade when this draft marched out of the camp for the Front. Compulsory military service became law in 1916. Ampthill Park then ceased to be a training camp for volunteers and became a depot in which 8069 men returning wounded and invalided from the Expeditionary Force receieved remedial training. Three thousand five hundred and forty three of these men returned to the Front Line. Ten thousand sixe hundred and four men passed through the camp between November 1914 and March 1919. "Remember the Lord great and terrible and fight for your brethren, your sons, your daughters, your wives and your homes"
Looked down to bless our lesser camres." 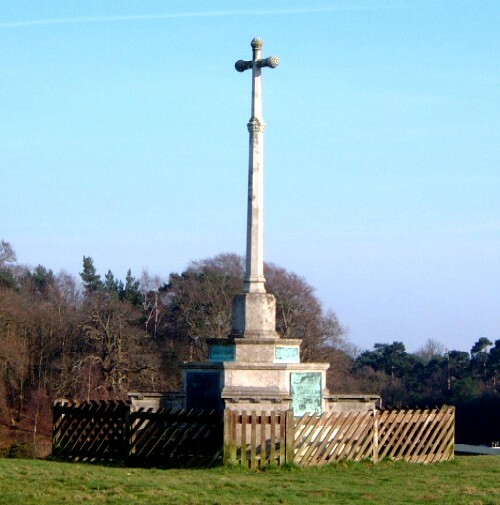 The cross overlooks the hollow down which 2235 officers and men passed when, on completion of their training, they left the camp at Ampthill to join the Battle Line in France. The Roll of Honour on the base of this cross shows that seven hundred and seven were destined never to return. "Death swallowed up in victory"
In memory of seven hundred and seven officers, warrant officers, non-commisisoned officers and men of the Bedfordshire Regiment, who were trained at the Ampthill Camp, and who fell fighting in the Great War of 1914-1918. This cross is erected by the first commanding officer Herbrand XI Duke of Bedford. As who had heard God's message from afar. To save mankind yourselves you scorned to save." through dust of conflict and through battle flame. Your memory hallowed on the land you loved." By kind permission of the Duke of Bedford and trustees of the Bedford Estate a list of names has been supplied that records the names that were on the remaining plates and those missing. These are split on several pages alphabetically.